I wanted to tell you that I only implemented Teatime this year and it is absolutely THE best thing I’ve ever done in our homeschool journey (I’ve been homeschooling for 7 years)!Â It is something we all look forward to each week and no matter what kind of day/week we are having we all ALWAYS feel better after teatime! And I want to encourage others that teatime doesn’t have to be perfect. Today for treats I unwrapped commercial Nutrigrain bars and cut them up into 4’s for small “cookies”, the kids and I loved them.Â And I didn’t even have tea in my tea cup today (I desperately needed another cup of coffee so that’s what I put in my pot).Â Also today I had a horrid relapse of a cold but we didn’t even considered not having and again got so much more done than if we hadn’t done anything, which is what would of happened BT (BeforeTeatime). 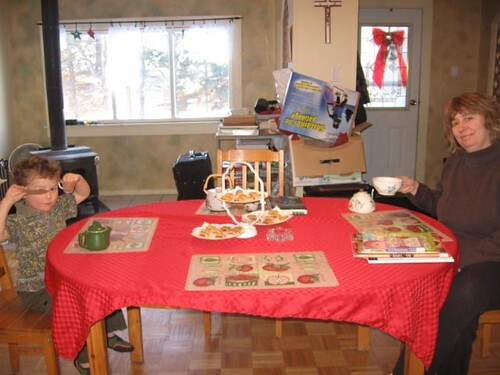 It’s so funny because now as soon as that red tablecloth comes out (the only time we use it is for Teatime) and the kettle gets put on the stove, the kids run to chose their “readings” and I too enjoy chosing books from the Teatime Bookshelf (books that I never seemed to have “time” to read to the kids). Thank you for introducing me to this concept and to Brave Writer itself! It’s a philosophy I always believed in but didn’t know how to articulate it or implement it but through your Writers Jungle and now taking the Kidswrite Basic course I feel your warm gentle hand holding mine while we sit around out teatime table. Again thank you from my entire family! 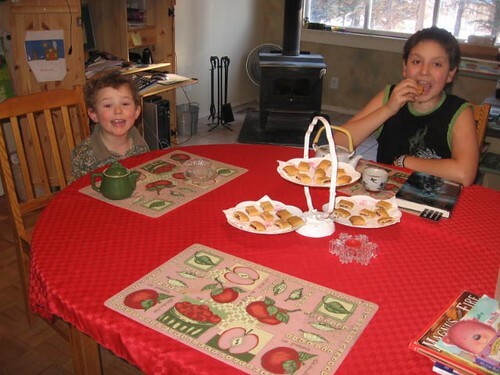 Homeschool Mom and a big believer in the Teatime philosophy!